A modern great just got greater (and more modern). World of Final Fantasy was a huge surprise when it debuted in 2016. Despite having the unenviable task of rolling out a mere month before the behemoth that was Final Fantasy XV, it lived up to the series’ name and then some. It was, by all accounts, a wonderful celebration of everything the franchise had going for it up until that point, and it quickly became one of my favourite entries in its own right. Two years later Square Enix have made the world of Grymoire even bigger, filling it with new additions and fanservice in its Maxima expansion. 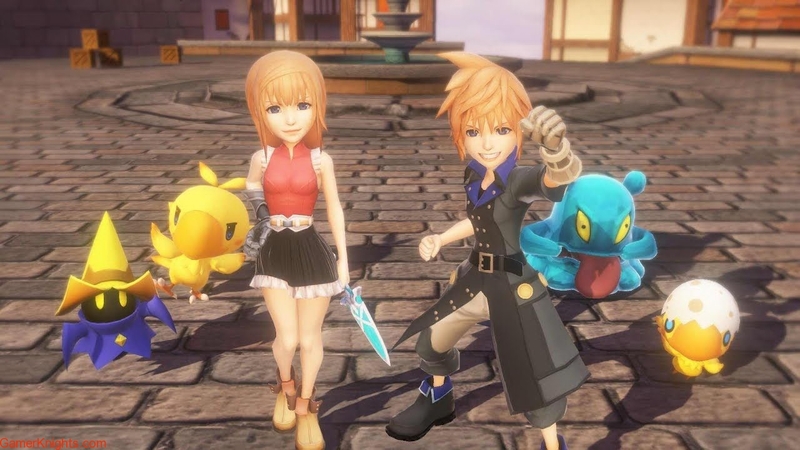 World of Final Fantasy was a journey through the history and the characters of FF via the all-new adventures of Lann and Reynn. As opposed to the serious tones of the mainline entries, WoFF was refreshingly playful throughout its runtime, and poked fun at the tropes and overly heroic staples the series had helped institutionalize. The script, which focuses on our two heroes on a quest to reclaim their lost memories and save the chibi world of Grymoire, is often funny, constantly breaks the fourth wall, and is full of interesting, well written characters – annoying mascot Tama aside. You quickly find out our sibling protagonists – who look like they’ve been salvaged from the cutting room floor of Kingdom Hearts 3 – are Mirage Masters; beast-tamers who can capture and train 30 years’ worth of Final Fantasy critters big and small. You’re sent into a strange realm – a traditional world-in-peril affair that is populated by adorable chibi denizens – to grab as many monsters as you can and use them to stop the next big JRPG calamity. 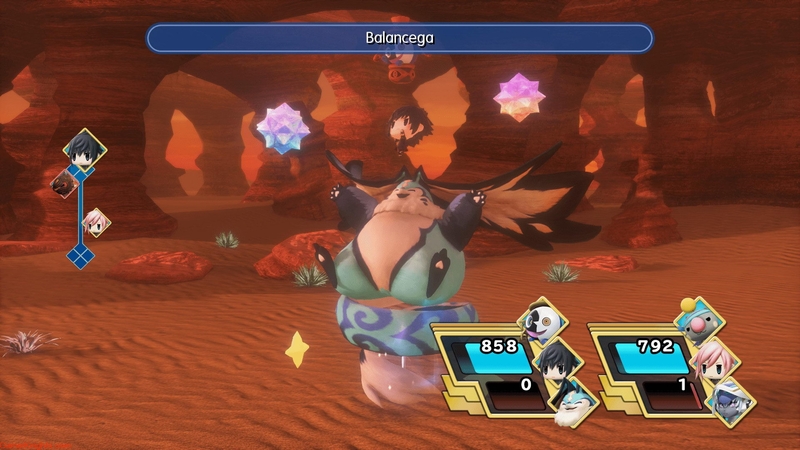 WoFF owes as much to Pokemon as it does its FF roots, as you drag a huge chunk of the memorable Final Fantasy bestiary that has built up over the years into battle alongside you as partners. When I say alongside, however, I don’t mean that literally: These monsters – all of which are cute, squashy things in the early game – stack atop your characters head to power up your Lann and Reynn and add their elemental affects (and weaknesses) to the mix. Depending on whether you roll into battle little or large, these totems change, allowing you to ride bigger creatures into the fray like mechanical hands or giant dogs. I fell in love with this system, and I was constantly editing and revising my party to find that perfect combo. It’s a hugely enjoyable twist on a classic formula, and one that made it easier to forgive some of WoFF’s other relics from the past. 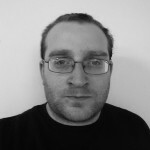 Random encounters, for instance, have no place in JRPGs anymore – not since Square Enix themselves fixed them with games like Bravely Default that let you control how often you were sucked into battle, or better yet, simply putting monster sprites on screen for you to try to avoid. The new Maxima additions round out the potential for cameo summons and creature features, bringing the game up to date in terms of Final Fantasy’s big releases. Noctis and Lightning are two of the most notable additions – both of whom are awesome to call upon during particularly tricky boss fights, some of which are completely new themselves. There’s plenty of new Mirages to capture, as well, as if there weren’t enough before. Maxima made replaying WoFF well-worth the considerable time sink, as it offered just enough fresh tricks to make the journey feel new again. World of Final Fantasy certainly isn’t lacking in charm. It looks great, and the world of chibis – as mentioned before – was an always endearing treat. The abundance of fan-service – which brings series veterans such as Squall, Cloud, Refia and the original Hero of Light back as cameos and summons – is a wonderful thing to behold for anyone who’s played even a handful of previous Final Fantasy games. The voice acting is patchy, with some really great turns from side characters elevating a fairly annoying main cast. You can also access the Japanese voice track which might help alleviate some of this initial distaste, but I’ll be the first to admit that by the end of my adventure I’d warmed to the dorky, dumb Lann and his know-it-all sister. The music on the other hand is fantastic throughout – but from a series as storied (and well-scored) as Final Fantasy we shouldn’t have expected anything less. The music that plays during summons, tunes harkening back to character-specific titles, are a particular treat. 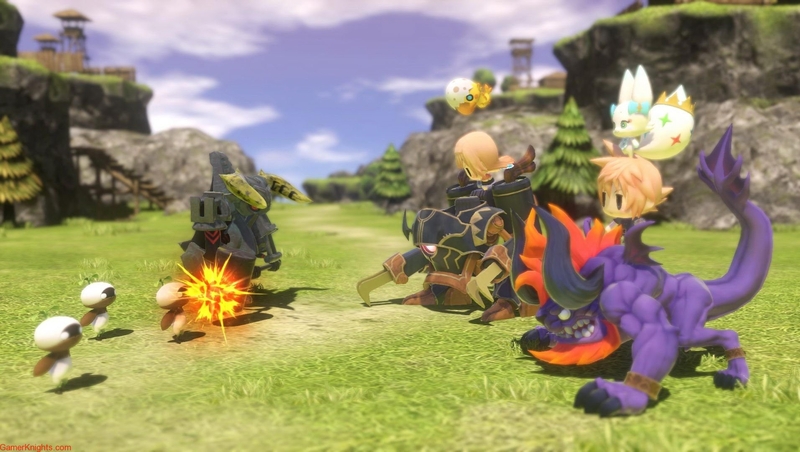 World of Final Fantasy was already an excellent package bursting with fun – both in its wacky story that plays out as a homage to every FF game that has come before and in its monster-stacking gameplay quirks. Maxima makes a great game even better – with plenty of new content to please fans old and new. If you’ve yet to play WoFF – and that’s not unlikely, as most people were looking forward to a completely different Final Fantasy at the time of its original release – now is the time to rectify that mistake. Don’t sleep on this fantastic JRPG twice.